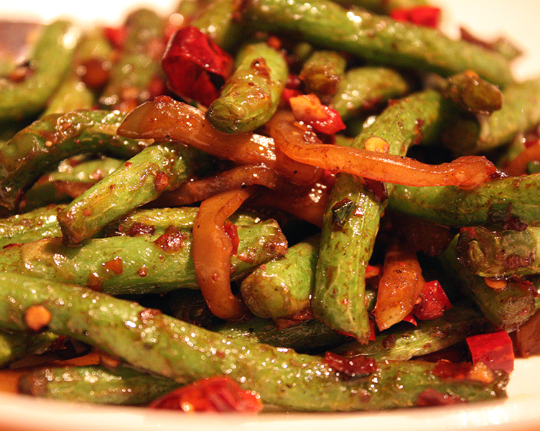 So much Chinese food often gets bogged down in grease, cornstarch and cheapo ingredients. So much so that when you taste a once-mundane dish elevated with primo produce, it can be a revelation. Such was the case when a friend and I encountered Chef Charles Phan’s distinctive take on the usual run-of-the-mill “Ants Climbing Tree” dish ($11) at his hip Heaven’s Dog restaurant in San Francisco, steps from the Holiday Inn Civic Center. 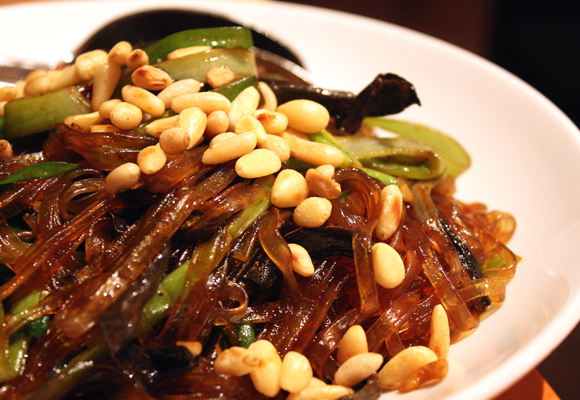 As a Chinese-American who grew up in San Francisco, I’ve long eaten this homey dish of ground meat (the so-called “ants”) cooked with garlic, soy sauce and ginger, then ladled over slippery cellophane noodles (the “tree”). My Mom would cook it or buy it to-go from an Asian deli. It was a fine dish — just nothing I necessarily ever craved or went out of my way for. That is, until I tried the one at Heaven’s Dog, which was a most pleasant surprise. This meatless rendition was loaded with fresh black trumpet mushrooms and plenty of leeks. The crowning touch was the toasted pine nuts sprinkled all over the top, giving it unexpected crunch and richness. There was so much flavor and texture that I almost felt like I was tasting this warhorse of a dish for the very first time. 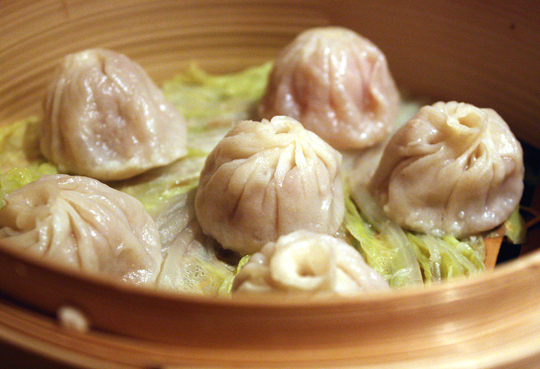 We couldn’t resist the Shanghai dumplings ($10), which burst appropriately with hot broth from the first careful bite. That was followed by a custardy tofu dish that had a crisp topping of minced scallops; and a side of Asian long beans stir-fried with spicy, pungent Szechuan pickles and red chilies. Desserts aren’t often the strong point of many Chinese restaurants. Here, you’d be missing out big-time if you didn’t order the fabulously intense Thai basil ice cream. The assertive licorice-cinnamon-herbal flavor comes through delightfully loud and clear in an almost savory way in this none-too-sweet ice cream. 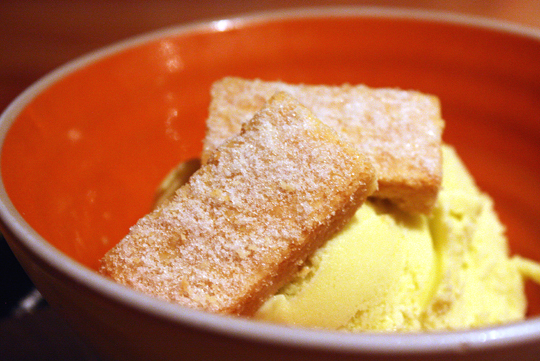 It’s garnished with buttery rectangles of orange shortbread dusted with sugar. 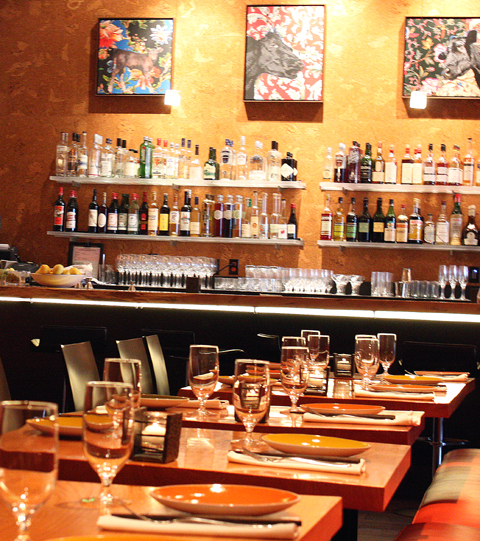 The modern orange and black restaurant offers a variety of wines and cocktails. For those who don’t want to imbibe, there’s a refreshing housemade elderflower spritzer that pairs seamlessly with the bold flavors of these dishes. To learn more about Phan, pick up a copy of the July/August issue of Food Arts magazine for my profile on him, when he was honored with the magazine’s “Silver Spoon” award. thai basil ice cream? seriously? that sounds so good. I’ve never heard of “ants climbing tree” dish growing up, and not sure if I would have ordered it if I saw it on the menu! Is that how it’s listed at Heaven’s Dog? 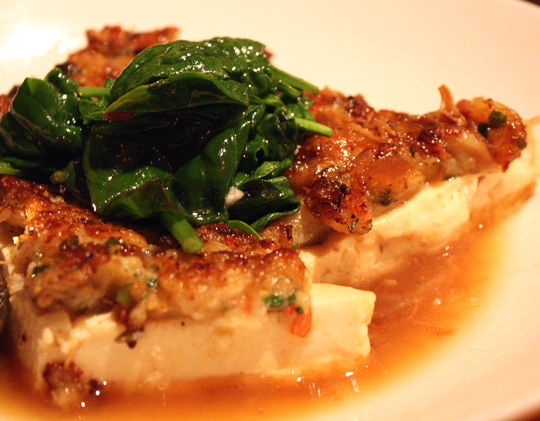 The tofu with minced scallops looks amazing! Love their basil ice cream. I order that each time I head to Out the Door on Bush. Terrific menu – I always get the dungeness crab vermicelli dish too. Yum! I don’t think I’ve ever ordered ice cream at a Chinese restaurant before but it sounds yummy! We used to get Yellow Custard or Red Bean Soup when I was a kid. I must pass near this place everyday as I grab BART at the Civic Center, I need to look for it! The Thai basil ice cream sounds amazing here! Okay, with all the crappy American-chinese take-out places by me, this is a gem. “Ants Climbing Tree” doesn’t sound all that appetizing, until you unraveled it before our eyes with both your tantalizing picture and descriptions! Been so so long since I have eaten ““Ants Climbing Tree” …did they use pine nuts instead of ground meat? I cannot see the meat. It all looks delicious! What beautiful photos! This looks nothing like the Chinese food I usually have…except for the one time a Chinese woman I was working with brought me to a real Shanghainese restaurant. The food was out of this world. Not greasy, authentic, delicious. I’m particularly interested in “Ants Climbing Tree” dish! That looks nothing like a typical Chinese dish! Im not in the Civic Center area too often, but now I think I have a good excuse to go. This food looks amazing.